Construction crews have been making great progress on rail removal and laying down interim trail. We will continue to let you know when crews have reached major milestones, but in the meantime please check our ERC website for updates. 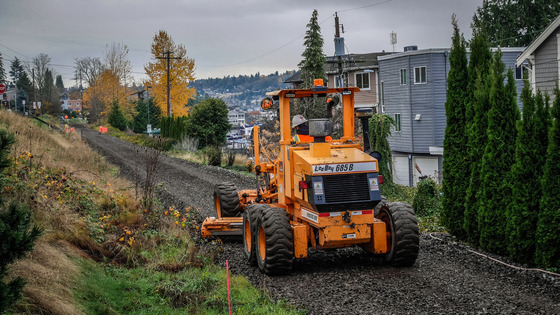 Rails have been removed and a base layer of gravel trail has been graded smooth from Coulon Park up to N. 37th Street, north of Kennydale Beach Park. Crews are presently removing tracks and ties from areas around the Seahwak's Virginia Mason Athletic Center (VMAC) and Ripley Lane. 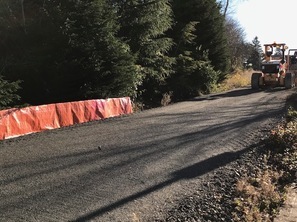 Sections of the interim gravel trail have been graded smooth with a base course of gravel. An additional layer of finely crushed, compacted, ADA accessible gravel will go on top of this base. Construction at the intersection of Lake Washington Boulevard North at 33rd Street is expected to start on December 12. As weather allows, work will proceed on roadway and driveway crossings moving from south to north between December 12th and approximately January 20th. Work in intersections will always maintain one open lane of travel and will always have flaggers and traffic control measures in place. We have been excited to see community members using sections of the trail where rails have been removed. If you do use these sections please remember to be careful and remain alert as there may be active construction in the area. 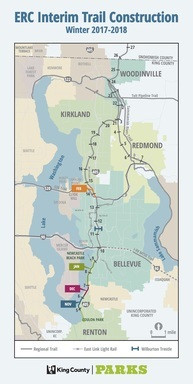 - Four miles of interim trail south of I-90 connecting Renton to Bellevue between Gene Coulon Park and Newcastle Beach Park, with connections to the Lake Washington Loop Trail at both ends. For those of you who live near the trail, look for signs at intersections letting you know when work is coming your way. For questions, please contact Erica Jacobs [Project Manager] at Erica.Jacobs@kingcounty.gov or (206) 477-5539.